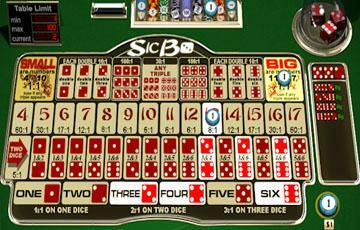 Sic Bo is one of those casino games that maybe some people may not have heard of. Its unique name can give someone the first impression of a very complex game full of hard-to-remember rules. In reality, it’s quite easy. Sic Bo is an ancient Chinese game that is played with three six-sided dice. The object is to attempt to predict the numbers and number combinations that will come up when the dice are rolled. It’s similar to Roulette in the sense that you bet on what you think will come up. Basic wagers range from betting on specific numbers, 1 through 6, or an exact total, 4 through 17. Some bets, like the Big or Small bets for example, pay even money, while correctly predicting a Triple, three of the same number, pays as high as 180 to 1. There are strategies that can be employed to improve your chances of hitting the big win. The strategies for Sic Bo also share similarities to the strategies used in Roulette. These Sic Bo strategies can be divided into different categories according to the amount of risk involved. The higher the risk, the greater the potential reward; the lower the risk the less likely you will score a big win. There are many factors involved in gambling, clearly, but we can use these strategies to help with that. Obviously, the chanciest bet in Sic Bo is the specific triple bet, such as 4-4-4. If it wins it pays out either 150 to 1 or 180 to 1, depending on the house rules, but the probability of such a thing happening is .46%, or about 217 to 1 against. If all you do is bet triple, you will be on steady road to losing your bankroll. But does that mean don’t bet triples? No. What you need to do try to compensate or balance it out with lower risk bets simultaneously. Let’s look at an example. Pick, let’s say, the number 2, for instance. Bet one unit on 2-2-2 Triple, then bet one unit on 2-2 Double, and finally three units on Single 2 straight up. The total risk is five units, and they balance each other out. Other combined-bet strategies are variations of this, such as wagering one unit on Double 1 and two units on Big, meaning big total number. They balance each other out. The Big and Small bets in Sic Bo are of the low-risk and low-reward Sic Bo strategies. They are basically the same thing as Red and Black bets in Roulette. For these, then, you can apply progressive Sic Bo strategies. The most promising ones should be able to endure four or five consecutive losses without requiring huge wager to make up for the money that was lost. D’Alembert: This system is based upon the “Law of Equilibrium,” assuming that the number of spins a player wins and losses will, over the long term, be very close to 50:50. Following a loss, the player increases the wager by one unit. Following a win, the wager is reduced by one unit. The progression ends when the required bet is zero, and then it begins again. Laboucehre: Also known as the “cancellation system,” this is a negative progression that requires wagers to be increased when losses occur. It begins with a series of numbers, such as 1+2+3+4. The player wagers the first and last numbers—in this case, 1+4 = 5. If the hand wins, those two numbers are crossed off and the remaining two numbers are bet. Upon a loss, the amount of the loss is added to the end of the series and the first and last numbers are bet. This continues until all numbers have been crossed off. 1-3-2-6 Betting System: This is a positive progression, meaning bets increase with wins, not losses. The goal is to win four hands in a row, betting one unit until it wins, and then three units. If it wins, then two units are wagered, followed by six units after a third win. Any loss resets the progression to one unit. Hope these strategies help fine-tune your game. Have fun!